In both situations, people are stepping up to support each other. They’re making sacrifices and taking risks often for total strangers they’ll never see again. For example, 250 first responders from Nashville drove to Florida before the hurricane even arrived there to be ready to jump into action. Until the professionals could respond, residents in every community improvised rescues to free their neighbors who were in danger. The world can simultaneously be an incredibly threatening place AND a kind and generous place. Some people dedicate their lives to stepping up for others. Some of the most praiseworthy people on the planet are first responders. They’re courageous women and men who risk their own well-being to help people when they’re most vulnerable and in need. How could you not respect these people? They understand the huge risks of doing their job, and they choose to do it anyway. In fact, the greater the peril for the people they’re helping, the more risk they seem to be willing to face. Here’s the part that doesn’t add up. As a way of keeping us safe and alive, human brains are wired to feel fear when we perceive danger. Fear gives us three clear choices: fight, flight, and freeze. However, walking into danger to help someone else, especially someone you don’t even know, is NOT on that list. What makes a first responder go against their natural fear and put themselves at risk? Thankfully, there are forces in all of us even stronger than fear. One of them is courage—the emotion you feel when you’re dedicating yourself to something bigger than you. First responders absolutely feel fear. But they’re so dedicated to the bigger cause of serving and caring for others, they generate a courage even more powerful than fear. 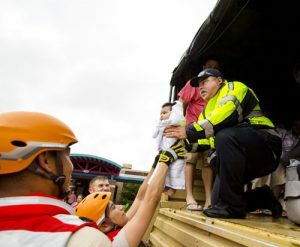 In a catastrophe like a hurricane, there aren’t enough first responders. Suddenly ordinary citizens start to take risks and make sacrifices to support others. Especially in extreme conditions, any one of us can recognize a cause or purpose bigger than ourselves is at play. Courage is always there within us. And when it’s evoked, ordinary people do extraordinary things. The personal benefits of courage. While no one does it for this reason, acting with courage on behalf of another generates an increased sense of meaning within yourself. When you’re overwhelmed by deadlines and schedules and frustrations, life might not feel so meaningful. But in that moment when you step up for someone else, you realize you matter greatly. What if we could align ourselves just a wee bit more with the causes and purposes we know are bigger than us? The fear will still show up. The fear our brains generate every day can be strong. Courage can be stronger. The point is, courage is always there. We all understand this. When asked, “what would you do if you had 10X the courage?”, most people can answer quickly what they would do. In other words, you probably already know what matters so much to you that it would help you generate greater courage. Put your attention there. The people in Texas and Florida remind us of the courage that exists in every human. Every human. I believe there is something that lies beneath courage that’s fueling it all. Pardon my French, but it’s Love. The real generator driving courage is love. When you dedicate yourself to something bigger than you, isn’t that really what you’re feeling? The overwhelm and fear we feel when we focus on deadlines and burdens can dampen anyone’s spirit. What would YOU do if you had 10X the courage? The part of you that answers is the first responder in you. Take a step in that direction, now. You don’t need a hurricane to remind you.